Remember When Big Brother's Only Weapon Was CCTV? When I was a kid, there was no image more closely associated with surveillance than the CCTV camera. Big Brother is watching, we were warned. The government is keeping tabs on you with video cameras on every street corner. Soon they may even install cameras in your home, they insisted. Honestly, that may have been preferable to what we ended up getting. In many ways, the CCTV camera is a terribly inefficient device to monitor a population. Sure, they're handy after the fact, like in the case of the tragic bombing at the Boston Marathon. But if you really want to stop someone from doing something violent and horrendous, you need indications of what that person is going to do in the future. Cameras on every street corner may help identify patterns of behavior, but they're obviously less valuable than monitoring electronic communication like emails, instant messages, phone calls and texts. Revelations in the past month that the NSA has been monitoring domestic electronic communications—beyond any idea of what the American public had come to expect—has rendered idea of persistent surveillance via TV images downright quaint. But that was certainly the surveillance future in 1960. 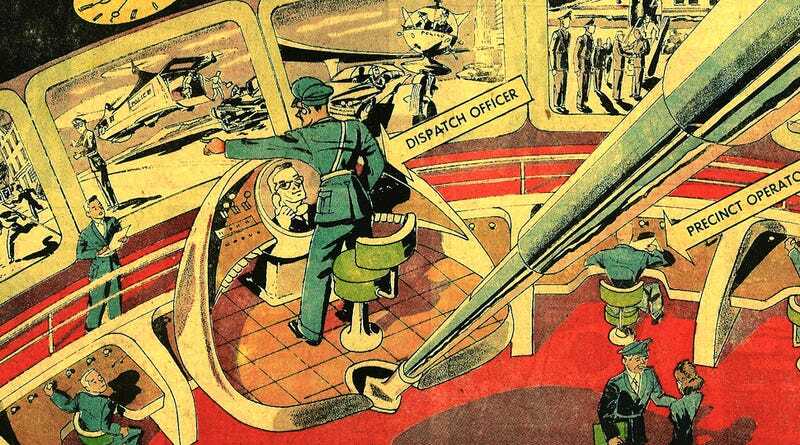 The May 15, 1960 edition of Arthur Radebaugh's Sunday comic "Closer Than We Think" imagined the police station of tomorrow as a sort of always-connected war room. The dispatch officer might have dozens of TV cameras in front of him, each showing different parts of a given city. A terrifying image of police overreach? Sure. But somehow less terrifying than our reality here in the 21st century. In the world of tomorrow, transistors and diodes will do more than squad cars to enforce the law. In fact, the day of the electronic policeman is already at hand! Television is now monitoring expressways in Detroit and reporting on ticket availability at Pennsylvania Station in New York. In the future, similar systems will help smash crime, using sunlight when available and infrared "snooper" rays the rest of the time. All findings will be transmitted automatically to police dispatch rooms, where one officer will see his entire precinct in a cluster of closed circuit TV screens. It's funny how quickly the imagery of what constitutes a total surveillance state can change. Security cameras aren't the symbol that they once were. Of course, CCTV monitoring by police is still an issue for privacy advocates around the world. And who knows precisely what will happen when a broad network of security cameras teams up with the NSA supercomputers running programs like PRISM and PRISM's (yet unknown) dystopian brothers? But no matter what the police and government surveillance initiatives of the future look like, the camera all by its lonesome will feel like a comically impotent symbol. The government may always be watching. It's just that now know that it's not with a camera, but with code.